Four years after his fascinating and highly praised album with works of the Spanish composer Mompou, Arcadi Volodos went into the Berlin Teldex Studio again to deliver another reference recording, this time with the music of Johannes Brahms. 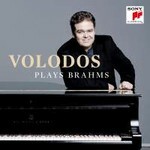 Volodos has played the Brahms solo pieces over the past years in places all over the world and received highest critical acclaim for his interpretation. The Brahms solo works are perfect to show Volodos unique ability to create a special and magic sound, a sound "which lifts us, the listener, into the air and which makes us believe that the world is floating" (Frankfurter Allgemeine Zeitung). Recorded in the famous Teldex Studios Berlin in three sessions (2015 - 2017) on a great Steinway Grand Piano specially tuned by Michel Brandjes, one of the best tuners in the world. There is no editing in this recording. Volodos played every piece over and over again to develop his idea of structure and sound and chose the best version of each piece after the end of the recording.